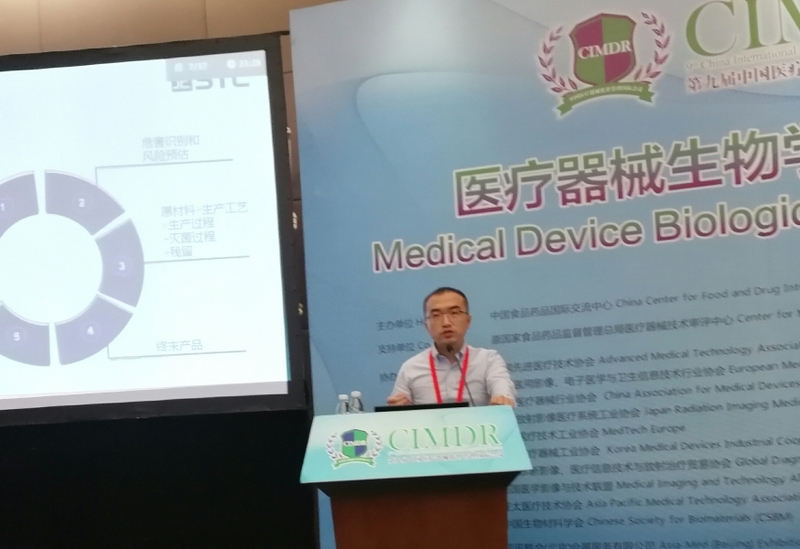 China, September 15th, 2018 - The 9th China International Medical Device Regulatory Forum is being held at the Fuzhou Strait International Conference and Exhibition Center from September 13th to September 16th, 2018. This afternoon (September, 15th), Mr. Jonathan Tang, Director of Research & Development, STC Medical Device Testing Department was invited to share his in-depth knowledge and expertise through leading an informative seminar on “How to Use Chemical Characterization Testing in the Evaluation Process of Medical Devices” which provided forum attendees valuable insight in the biological evaluation field of medical devices. Successful held for eight consecutive years, the annual China International Medical Device Regulatory Forum has played a pivotal role in promoting China’s policies and regulations on medical devices and enhancing the international exchange and cooperation among foreign medical device regulatory authorities and evaluation bodies. 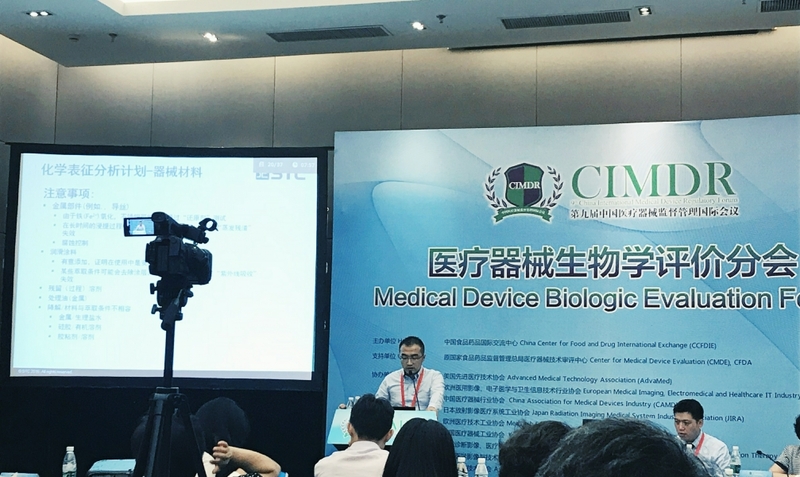 STC’s participation in this significant forum provided many opportunities for mutual learning and experience exchanges to further strengthen the development and progression of China’s medical device testing capabilities and standards. 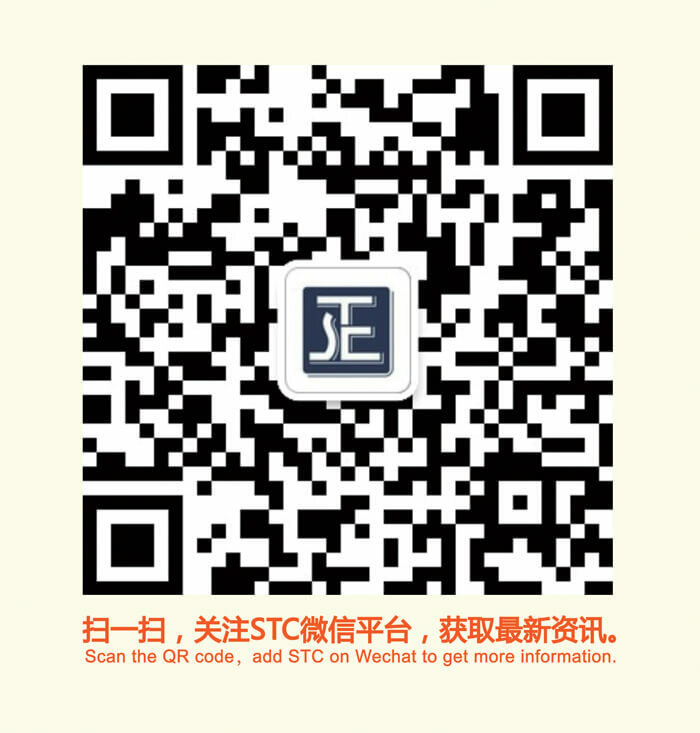 STC (Dongguan), a member of the STC Group was founded in 2005 as an independent, third-party product Testing, Inspection and Certification body approved by the General Administration of Customs of the People’s Republic of China (GACC). 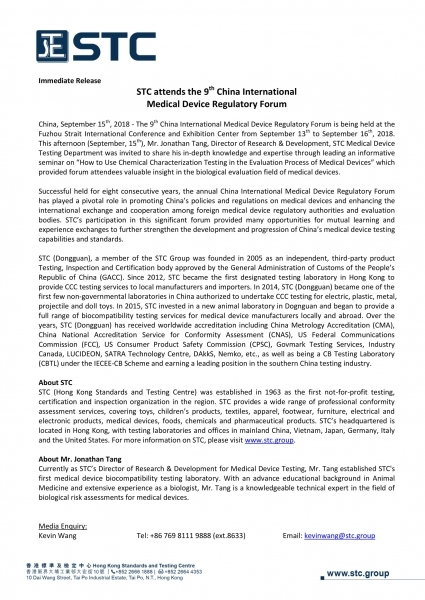 Since 2012, STC became the first designated testing laboratory in Hong Kong to provide CCC testing services to local manufacturers and importers. In 2014, STC (Dongguan) became one of the first few non-governmental laboratories in China authorized to undertake CCC testing for electric, plastic, metal, projectile and doll toys. In 2015, STC invested in a new animal laboratory in Dognguan and began to provide a full range of biocompatibility testing services for medical device manufacturers locally and abroad. Over the years, STC (Dongguan) has received worldwide accreditation including China Metrology Accreditation (CMA), China National Accreditation Service for Conformity Assessment (CNAS), US Federal Communications Commission (FCC), US Consumer Product Safety Commission (CPSC), Govmark Testing Services, Industry Canada, LUCIDEON, SATRA Technology Centre, DAkkS, Nemko, etc., as well as being a CB Testing Laboratory (CBTL) under the IECEE-CB Scheme and earning a leading position in the southern China testing industry. STC (Hong Kong Standards and Testing Centre) was established in 1963 as the first not-for-profit testing, certification and inspection organization in the region. STC provides a wide range of professional conformity assessment services, covering toys, children’s products, textiles, apparel, footwear, furniture, electrical and electronic products, medical devices,foods, chemicals and pharmaceutical products. STC’s headquartered is located in Hong Kong, with testing laboratories and offices in mainland China, Vietnam, Japan, Germany, Italy and the United States.For more information on STC, please visit www.stc.group. 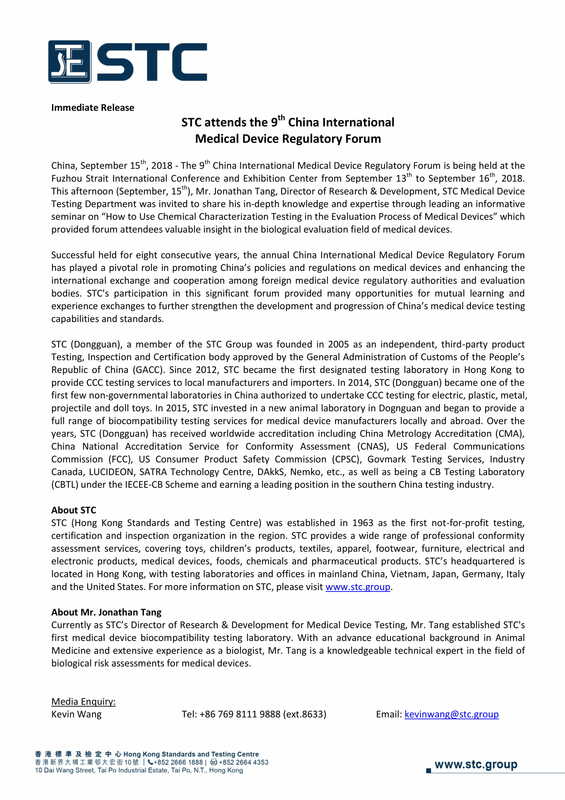 Currently as STC’s Director of Research & Development for Medical Device Testing, Mr. Tang established STC's first medical device biocompatibility testing laboratory. With an advance educational background in Animal Medicine and extensive experience as a biologist, Mr. Tang is a knowledgeable technical expert in the field of biological risk assessments for medical devices.